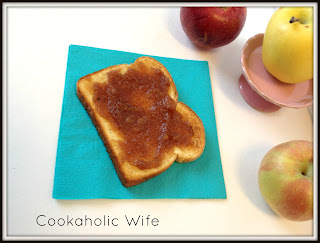 The first time I ever had apple butter was after Tom and I had visited an orchard. He loves the stuff and picked up a jar of it while we were there. I’d never heard of it before and was interested to see just what this stuff tasted like. Let’s just say I was instantly made an apple butter fan. When I realized how incredibly easy it is to make, especially in the crock pot, I couldn’t help but whip up a batch. 1. Combine all ingredients in a 4 quart crock pot. Cover and cook on high for 5 hours or low for 10 hours. 2. Use a wooden spoon to lightly mash the apples. Place a fine-mesh sieve over a large bowl and transfer the apple mixture into the sieve. Let drain for 1 hour. 3. Discard the liquid. Transfer the apple mixture to a food processor or blender and puree until smooth. 4. Transfer apple butter into containers and refrigerate for up to 3 weeks. Since I used Cortland apples for the apple butter I chose to use water instead of apple cider in the recipe. I also left my apple butter somewhat chunky, kind of more like apple-sauce than a store bought apple butter, but hey, its all about preference. I’m glad I made the decision to switch out the cider for water because this ended up much sweeter than I expected. Next time I’m going to use a combination of sweet and tart apples to hopefully reduce the sugary-ness.